Art is the most intense mode of individualism that the world has known. It is often a silent poetry which cannot be read. Tanjore painting is also one of the kind. 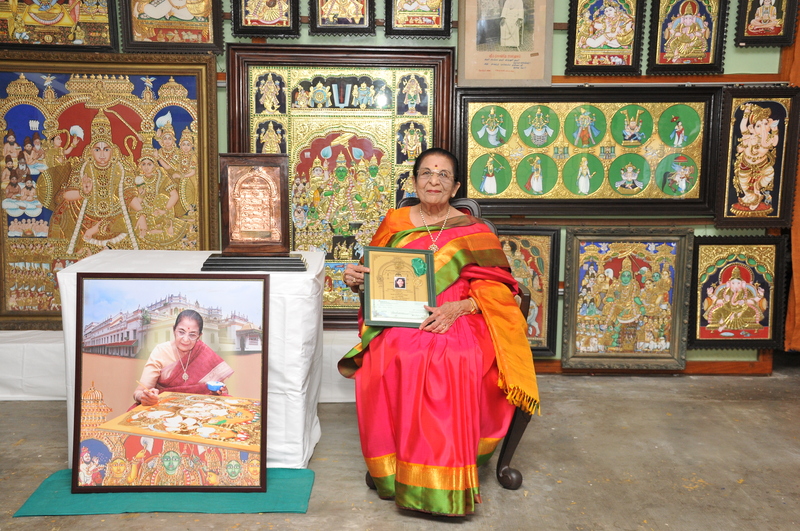 Dr. Mrs.Meena Muthiah, a connoisseur of art has been a patron of Tanjore Painting by learning the art from her Guru and did not just stop with that, but made it available to all art lovers by starting a school of arts in her premises. Many students from her school are now engaged in spreading it far and wide across the globe. In recognition of her awe-inspiring work, she was awarded with The Living Craft Treasure Award, 2016-2017. This award was introduced in 2013 for ten extremely talented and proficient Indian artisans. It was a proud moment for her as well as for the school, when her undertaking was recognized. The award was presented to her by THE POOMBUKAR, GOVERNMENT OF TAMIL NADU.